These dates are available for check-in. These dates are available for booking. These dates are not available for check-in. THE COASTAL PALMS HOUSE IS PART OF THE COASTAL PALMS HOTEL AND HAS BEEN RECENTLY REFURBISHED. 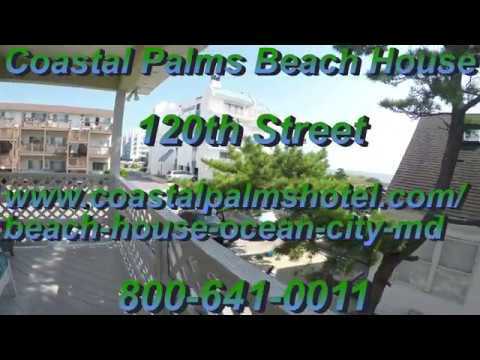 YOU CHECK-IN AT THE COASTAL PALMS HOTEL AND HAVE USE OF THEIR OUTDOOR POOL. THIS IS AN OCEAN BLOCK HOUSE JUST 60 STEPS TO THE BEACH. THE BEACH HOUSE IS A NON-SMOKING PROPERTY. SMOKING IS NOT PERMITTED IN THE HOUSE OR ON ANY OF THE BALCONIES - YOUR ACCOUNT WILL BE CHARGED $350.00 FOR A SPECIAL CLEANING FEE IF WE FIND EVIDENCE OF SMOKING. THERE ARE 14 STEPS UP TO THE ENTRANCE LEVEL OF THE HOUSE. ATTENTION GUESTS: THE CREDIT CARD THAT IS USED TO SECURE YOUR ON-LINE RESERVATION MUST BE PHYSICALLY PRESENTED UPON CHECK IN. THIS IS AN ADDITIONAL SECURITY PRECAUTION TO PROTECT YOUR PERSONAL INFORMATION. A two night minimum rental is required for all reservations - One night reservations can not be accepted. 2 Bedrooms, 2 Full Bathrooms, Living Room with an oceanview balcony, Kitchen has a Balcony with a southern view. Master Bedroom has a private bath, there is a second full bathroom in the unit. CHECK IN TIME AFTER 4:00PM. CHECK OUT TIME BY 10:00AM. SPECIAL NOTE: THE ON-LINE CONFIRMATION YOU RECEIVE IS NOT AN OFFICIAL CONFIRMATION, SINCE THIS IS A MANUALLY UPDATED SYSTEM. YOU WILL RECEIVE BY E-MAIL A FINAL CONFIRMATION FROM glen.cropper@carouselhotel.com or reservations@carouseloceanfronthotel.com. WE HAVE A 21 DAY CANCELLATION POLICY (PRIOR TO YOUR SCHEDULED ARRIVAL DATE). ANY RESERVATION CANCELED PRIOR TO 21 DAYS OF YOUR ARRIVAL WILL RECEIVE A FULL REFUND OF THE ROOM AND TAX DEPOSIT. RESERVATIONS CANCELED LESS THAN OUR 21 DAY CANCELLATION PERIOD WILL FORFEIT THE FULL ROOM AND TAX DEPOSIT. PLEASE CONTACT THE CONDOMINIUM RESERVATION OFFICE @ 1-866-622-2282 FOR ANY AND ALL CANCELLATIONS - YOU CANNOT CANCEL ON-LINE. We provide your initial set of towels, linens for all beds, paper towels, toilet paper, tissues, dishwasher detergent, dish washing liquid & laundry detergent, coffee, cream & sugar. We also provide an initial supply of standard bathroom amenities; soap, shampoo, etc. are also provided. The condo is furnished with a basic set of pots & pans, utensils, glasses, cups & dinnerware. Date chosen is not available. Weekly Only: This unit is available for weekly rentals only with Monday, Tuesday, Wednesday, Thursday, Friday, Saturday, Sunday check-in and check-out. We strive to provide the highest level of guest satisfaction to all guests utilizing the hotel. In order to maintain the highest standards possible, the Carousel has adopted a No Party Tolerance Policy. If for any reason a guest in any room or condominium disturbs or disrupts any other hotel guest, the Carousel reserves the right to evict any violators with no refunds of any money paid. In accordance with state and local laws, all persons must be 21 years of age or older to consume alcoholic beverages or to have alcohol in their possession. All violators of this policy will be evicted without refund of any money paid. Sorry, pets are not allowed in the Rental units. We have a 21 day cancellation policy. Reservations canceled prior to 21 days of your arrival date will receive a full refund of the room and tax deposit The Processing Fee is non-refundable. Reservations canceled within 21 days of arrival will forfeit the full room and tax deposit. Please contact the Condominium Rental Office toll free at 866.622.2282. Cancellations can't be made on line. The credit card that is used to secure your reservation must be be physically presented upon registration. If the credit card being used can not be presented and/or belongs to a third party, an authorization form will be provided upon request. This is a security precaution to protect your personal information. The Carousel is a non-smoking building - smoking is not permitted in the condominiums or on any of the balconies of the condominiums - your account will be charged $350.00 for a special cleaning fee if we find evidence of smoking. Please use designated smoking areas. Thank you - your cooperation is greatly appreciated. The entire indoor pool area (Sauna, Gym, Changing Rooms, etc) will be CLOSED between January 6th, 2019 (4pm) till January 31th, 2019.